As you know, I’m in Honolulu right now, and yes, it’s awesome. Jesse and I are staying in a studio room at the Royal Garden at Waikiki, a Wyndham Vacation Resort. 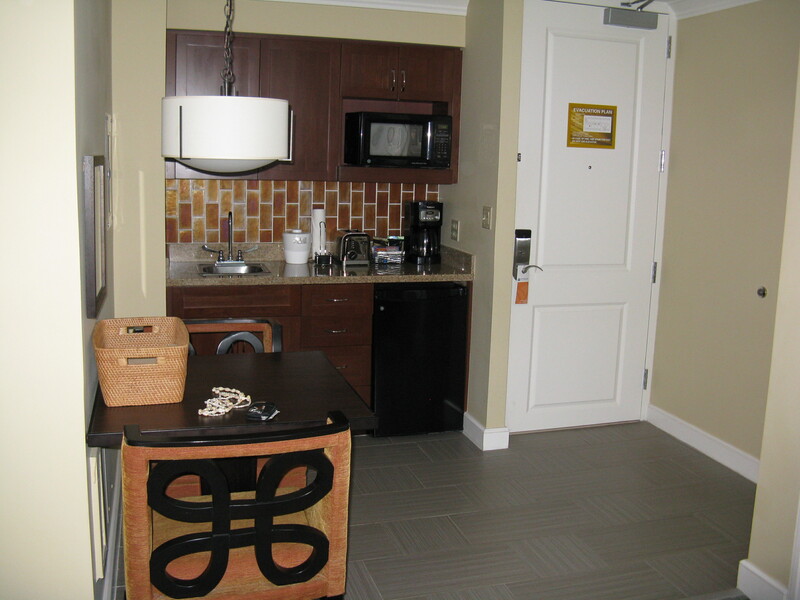 We have a partial kitchen with a sink, refrigerator, microwave, dishes, etc. I thought we’d have a stove, but since it’s just a studio, we don’t. The rooms with 1+ bedroom have full kitchens though. Regardless, it didn’t stop me from buying a dozen local eggs during our stop at Whole Foods the other day. We went there to get snacks and food for breakfasts to save on eating out all the time. It was fun seeing all the different regional produce and local products there. Anyway, back to the eggs. I had a plan to cook them and it consisted of heating up water in the coffee pot and pouring it over the eggs to hard cook (hard boil) them. I placed the eggs in a large Pyrex bowl, covered them with hot water that ran through the coffee maker, placed a lid over the bowl and let the eggs sit for about 20 minutes (I know there’s a way of cooking eggs similarly on the stove, so that’s what I was going for). Afterward, I gently cracked an egg at one end and peaked in to find … uncooked egg. Boo, my plan did not work. Inside, the egg was frothy and not even remotely close to being done. Even though I knew eggs (in shell) explode in the microwave, I proceeded to put the egg in the microwave anyway. Since it had a little hole at the end, I thought it’d maybe be okay. I placed it inside of a cup with a little water and 25 seconds later, BOOM! It exploded all over the microwave, although some of it stayed intact in the cup. Luckily, the egg that stayed in the cup was completely cooked and looked fine, so I ate it. It was really unwise on my part to put it in the microwave in the first place. Duh! I should have taken a photo of the mess, but it was such a stupid act, that I didn’t. Pouring the hot water over the eggs. 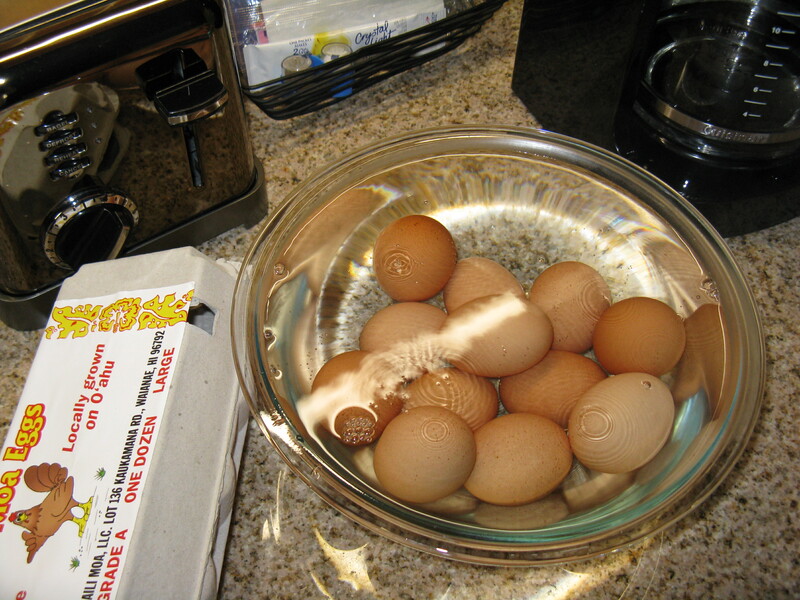 Eggs covered with hot water and ready to be covered. Since my original plan failed, I needed a different way to cook my eggs. I learned that eggs cook in the microwave just fine when cracked into a dish, sans the shell. I cracked two eggs into a mug, added salt and pepper and microwaved for 1.5 – 2 minutes at 50% power. It worked great! I haven’t had any problems with the egg sticking to the mug, but it’d still be better if I had some coconut oil or butter to grease the mug, mainly for flavor. I didn’t want to buy butter or oil though, knowing I probably wouldn’t use it all in time. 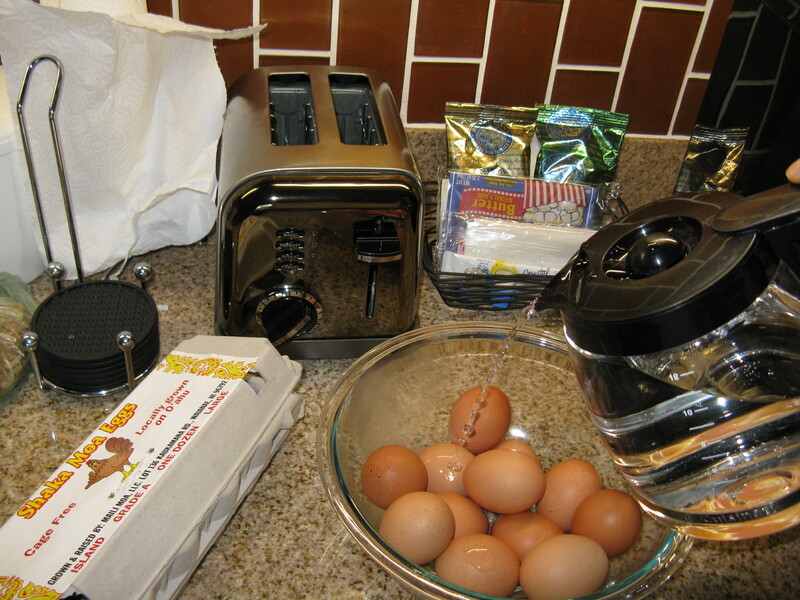 So, the next time you’re traveling and want to save on eating breakfast out, buy a carton of eggs and cook them in the microwave (if you have a microwave at your hotel, that is). Cheap, fuss-free and easy. 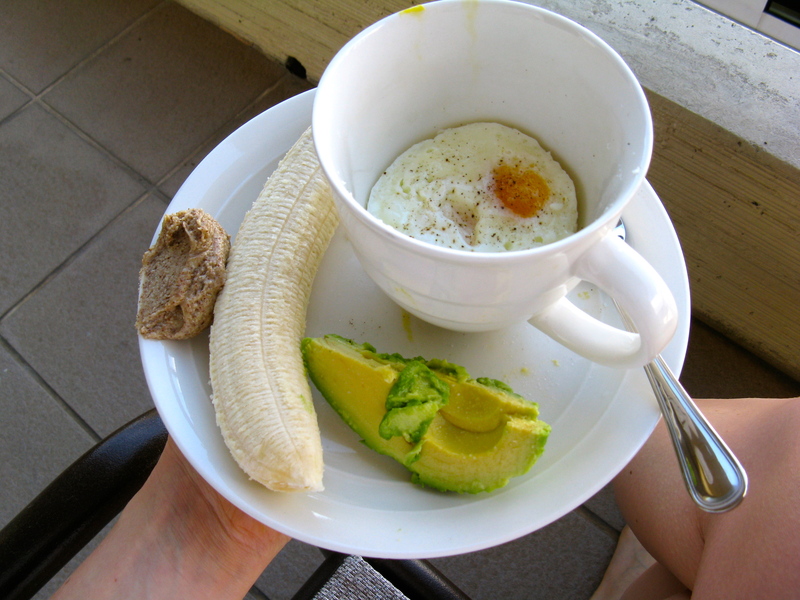 Mmm … breakfast outside on the lanai: two eggs, avocado, and a banana with fresh ground almond butter. Same thing the next morning, but with two slices of Applegate Naturals turkey salami. Again, I ate this out on the lanai. Hahaha sorry I had to laugh about the exploding eggs! I can imagine it was probably a pain to clean up! Ha, no worries … I laughed at myself too! Yes, it was quite messy with shell and yolk all over the place. Lesson learned! What a great idea! I remember back in middle school taking the single serve cheese it bags and microwaving them, they shrink into the size of a quarter!! Whoa, can’t say I’ve ever done that! I really need to try that breakfast. 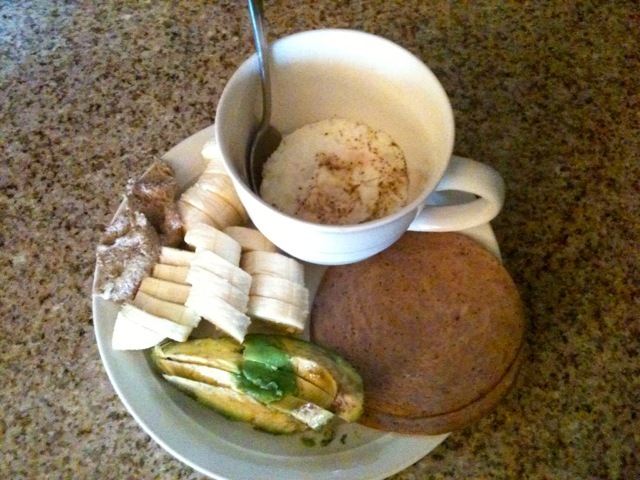 I think I worry cause my morning appetite = zero. And I eat eggs and avocado , etc all day long and night long too…oops. do you cover the mug? I heard that adding a teaspoon of apple cider vinegar helps…not sure. Will have to try. You are such an awesome intuitive eater. I NEED to work on that…I just ate a big meal that included a extra large tin of tuna and it sits on my stomach like a rock. All these heavy meals don’t help my stomach at all. Oye. I don’t typically eat a whole lot of tuna, but was craving it…unfortunately only after I ate it I noticed that the ingredients included “disodium pyrophosphate”…whatever that is. Oh my. I need to be more careful. I hate eating things with “extra” mysterious ingredients. And awesome that you are in Hawaii. Goes to show what your positive attitude and spirit will do in life: give you wonderful adventures because you earn them. Have loads of fun. Hi Jill! No, I didn’t cover the mug, but you definitely can. Don’t worry about the tuna … sounds like your body wanted it and there’s no worries anyway if you’re on the underweight side. My best advice is to accept it and move on. Thanks, I’m having loads of fun in Hawaii! Lots of relaxation and tropical drinks! My body isn’t used to all of it, but I’m enjoying it and taking it in stride. I do this routine nearly every morning at my office since I workout in the mornings and rush to work straight from the gym. I also throw a handful of spinach or kale at the bottom of a glass bowl, top with two eggs, cover slightly with a lid, and microwave for 1 to 2 min. Voila. It’s such a clever idea! I jazzed the eggs up this morning for Jesse. Threw in some fresh, local chopped tomato and turkey salami with the eggs. Then, once done, I topped it with avocado. I had some spicy Thai soup that I bought extra of last night. I caught a bit of a bug yesterday, but feel am feeling better today thus far, so hopefully it’s on its way out!